LEN - www.lankaenews.com | Fate of Sirisena who displayed his chameleon colors to India.. 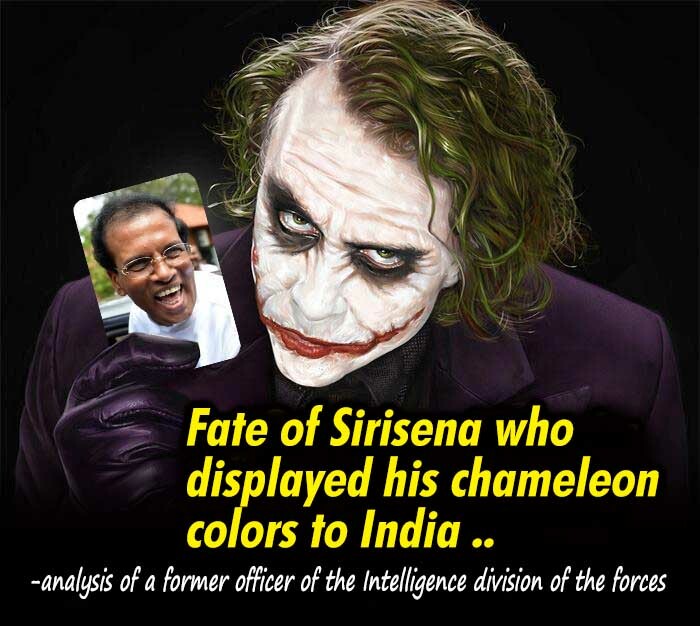 Fate of Sirisena who displayed his chameleon colors to India..
-Analysis of a former officer of the Intelligence division of the forces. (Lanka e News - 17.Oct.2018, 11.55PM) Throughout civilization espionage services had raged. During the stone age when people went on hunting they too spied on the movement of the animals. It was because of the spy service of the pundits the aggressors who came to capture city of Kandy had to flee for dear life . The Arab spring which turned everything topsy turvy in the middle East was not only a people’s uprising but also an espionage service. When one reads the history , it is very evident any Sri Lankan King who overrode India could not live peacefully. In other words in the making of kings and in the destruction of kings of Sri Lanka, India ‘s exertion of pressures had not been minimal. After Kasyapa became King it was Migara who was appointed as the chief commander (Mahasenevi). Kasyapa received the patronage of prince Mugalan the son of the concubine of King Dhatusena to work against Kasyapa. When the Kasyapa- Mugalan embitterment aggravated , it was Migara who took Mugalan to India. Finally when the war was waged against Kasyapa by Mugalan who came from India , it was Migara who betrayed Kasyapa. Migara was a follower of Jainism religion. It is very clear from this the actual spy responsible for the deaths of Kasyapa and Dhatusena was the Indian spy Migara. Is Gatekeeper becoming king a joke? In SL’s history , stories have been written about how the ruling Kings were murdered and the gatekeeper became the King. Though the gatekeeper becoming a king has been mentioned as a joke in history books ,it is not so. Anyway , It is not possible for a gatekeeper alone to single handedly take the true king to the guillotine and decapitate him . The gate keeping job is the lowest rank in the King’s administration. The conspiracy was hatched by the high ranking administrators and powerful courtiers of the king .The gatekeeper was just a pawn in it. If the story is read carefully ,it can be perceived to what extent the Indian espionage service had its ramifications in this murder. It is by murdering King Chandra Mooka Seeva , Yasalalaka Tissa became king.Chandra Mooka Seeva was married to a Tamil princess and had very close ties with India. According to Mahavamsa, Chandra Mooka was killed by Yasalalaka Tissa when he was bathing in the Tissawewa river . It was a close supporter of Chandra Mooka who had the necessity to avenge the killing of Chandra Mooka.Those who were close to Chandra Mooka were Indians.The gatekeeper Suba was an ordinary bloke without any royal background. It is therefore important to figure out whose pawn was this Suba. The gate keeper who did not even spend for a plain tea became king ! The gate keeper received the assistance of the high ranking courtiers and administrators of the King to most craftily kill Yasalalaka Tissa .Not only the gatekeeper , the high ranking courtiers and administrators were conspirators. Without doubt those courtiers and administrators too must have wanted to become king. Sirisena who tried to fool India jointly with Mahinda ..
Mahinda joining hands with China marginalized India to a half penny position. In 2014 , India which was offended used ‘gatekeeper’ Sirisena as a pawn to chase out Mahinda.Sirisena the gatekeeper who did not spend even for a plain tea became ‘king’. Sirisena who re awakened history is a most cunning fox. He not only began biting the hand that fed, but even amputated it. It is by now a well and widely known fact Sirisena within 48 hours of becoming president joined with Rajapakses who were defeated and discarded on the people’s mandate ,to hold discussions secretly in the nights after extinguishing the lights in order to dupe India. Though such low bred wolves in sheep’s clothing like Sirisena are of no consequence to India , certainly India is not going to hesitate or think twice to eliminate such poisons and poisonous influences from the zone. .
Sirisena who turned his back on India.. In the days gone by Sirima was suffering from an acute paranoia that CIA was spying against the country , which led her to work hand in hand with the Soviet union. With the advent of JR Jayawardena nicknamed ‘Yankee Dickie’ because of his great affinity for the US unyieldingly took a firm stand and turned tough against India . .
India which spawned armed groups with the RAW organization ‘s support , throughout the 30 years of war ‘supported’ not only JR but the entire country up to the point of saying , enough, and that ‘support’ could only be halted after India said , ‘okay’ . Late Premadasa on the other hand harbored a fear for the Mossad .He even appointed a Commission to investigate it. In the end he died of Babu’s bomb , not owing to Mozzad organization . Whereas Mahinda went off the track to woo China while turning his back on India . It was Mahinda himself who told, RAW was responsible for his defeat. In addition through the 19 th amendment the political future of Rajapakses was crippled .It is in this climate and context Sirisena had shown his true chameleon nature and hypocritical colors to India . Sirisena bidding farewell to politics can be soon witnessed by one and all. Even in distress humans will not attempt to kill diyabariya (a kind of snake). They will only hold it by a pole and throw it.